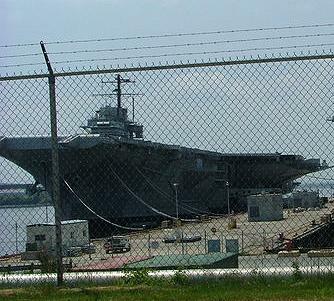 WASHINGTON, DC, December 14, 2010 (ENS) – At the Pentagon on December 15, U.S. Navy officers will decide how to dispose of the next generation of retired vessels, among them the ex-USS Forrestal, the aircraft carrier on which Senator John McCain served in 1967 in the waters of Vietnam. 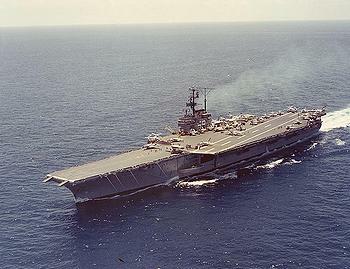 The 1076-foot Forrestal, the largest aircraft carrier of its day and the first to support jet aircraft, is slated to be dumped in deep water somewhere off of the East Coast next year to be used as an artificial reef. But a new report by the nonprofit Basel Action Network, released today, finds that the U.S. government underestimates the costs of ship dumping and fails to “properly” account for the economic advantages of recycling in U.S. ship dismantling yards – costing taxpayers millions of dollars and thousands of jobs each year. The BAN report, “Jobs and Dollars Overboard: The Economic Case against Dumping U.S. Naval Vessels at Sea,” details economic advantages of dismantling obsolete vessels for recycling, including jobs, the avoidance of externalized costs of pollution, damage to the environment and climate, as well as the conservation of metals resources. The failure to recycle the last 73 ships that were scuttled at sea in the past decade equates to the loss of 20,000 U.S. jobs and 560,000 tons of recyclable steel, copper and aluminum, worth around half a billion dollars, the BAN report claims. The U.S. government spent a total of $25.35 million, or $253 per ton, on the artificial reefing of four ships in the past eight years, the report states. By contrast, the cost of recycling retired vessels for metals recovery in these same years was an average $67 per ton, which would have meant a savings to the U.S. taxpayer of $21.5 million had the vessels been recycled. “Their goal is also to reduce the size of the inactive ship inventory utilizing multiple vessel disposal methodologies (i.e., foreign military sale transfers, ship donations, experimental/target use, title transfers to the Maritime Administration, domestic ship dismantling, and artificial reefing) that are most advantageous to the Navy, while also evaluating additional options for vessel disposal,” MARAD reported to Congress. BAN views the government’s pretext for the sinking of obsolete ships as flawed. “Using ships for target practice is unnecessary as the use of artificial targets such as giant balloons has been perfected, and there is no evidence that using old ships as artificial reefs improve fisheries and in fact may actually cause overfishing by concentrating fish populations for rapid harvest,” the organization said in a statement today. The USS Arthur Radford, a 563 foot navy destroyer, was scheduled to be sunk off the coasts of Delaware, Maryland and New Jersey in October, but has now been delayed until April, 2011, due to the fact that the cleanup effort has still left far too many toxic substances on board. However, the EPA and the Navy admit they will not be able to remove all of the toxic polluting substances without dismantling the ship. “The Radford is just the next, very bad example of the government blindly following a discredited policy of ocean dumping of old ships. For too long economics was used as an excuse for doing this. Now we have proved that the recycling of these ships is not only obviously better for the environment but it’s vastly better for the American economy,” said Self. Also of concern, BAN has learned that the preparation of the Radford for sinking is being done by a contractor, American Marine Group, which is under investigation by the EPA for suspected failure to remediate toxic PCBs from vessels sunk in Delaware waters in 2007 and in January 2010. If the Radford, currently in Philadelphia, were recycled rather than sunk, $6 million worth of recyclable metals would be saved that otherwise will be lost at the bottom of the sea, and a conservatively estimated 133 jobs would be created, says BAN in its report. All of the pollutants would be remediated as part of the recycling process. MARAD stores ships at three National Defense Reserve Fleet sites: the James River site in Virginia, the Beaumont Reserve Fleet in Texas, and the Suisun Bay Reserve Fleet in California.